Hi All! You are in for a wonderful treat! We are working on an e-book about the JR – to be released in the beginning of April. I’ve shared a little in the past about a new e-picture book I’m working on and trip I took last year on a research vessel, the JOIDES Resolution. 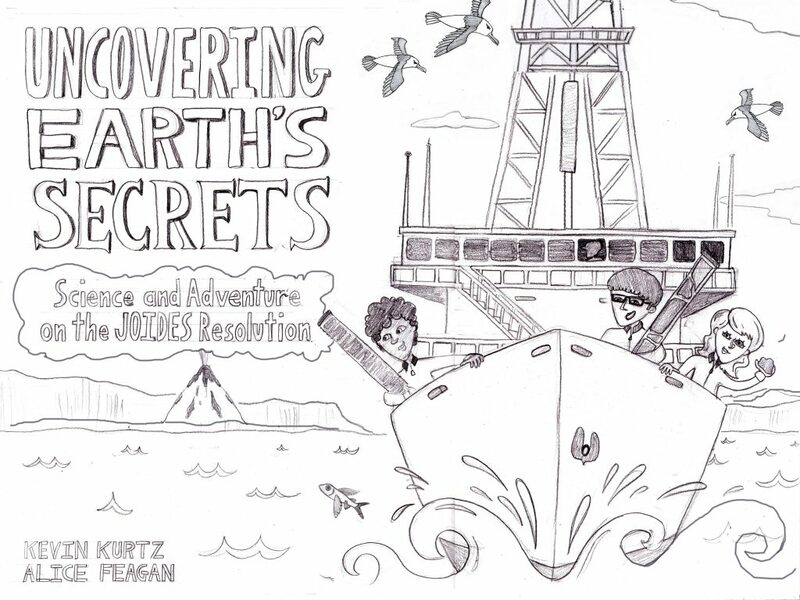 Since sailing from Curacao to Bermuda aboard the JR, Kevin Kurtz has written, and I am in the process of illustrating the still images for our e-picture book: Uncovering Earth’s Secrets: Science and Adventure on the JOIDES Resolution. We thought it would be fun to share a little sneak peak from the book as we get closer to a release date. Our text and illustrations are just the base of what will eventually be a fully interactive e-book designed for the iPad with games, animations, videos, print out coloring pages, links to the ship’s website, and more. The story, illustrations and interactive elements will teach kids about the ship itself, the crew of scientists, and their research that is aided and advanced by ocean floor drilling. I’ll share more as we move further along and our first version of the ebook becomes available…until then happy sailing!